Title change. 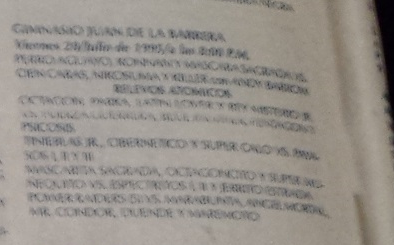 Super Muneco was rumored to be jumping to CMLL. *** 1/4, Espectrito faked a foul for the win. 21:00, **** 1/2, Latin pinned Jerry. ****. Tirantes started as ref, but Pena replaced him after one fall with Pepe Casas. Misterioso won the first with a boston crab in 4:10. Blue Panther, seconding Misterioso, attacked Voaldor between falls and Misterioso posted Volador. Panther accidentally hit Misterioso with a chair in the second, and the two fought leading to Misterioso being counted out in the second. Panther attacked Volador in the third and was about to piledriver him when Misterioso broke it up. Volador toped Panther, but Panther got up and knocked out Misterioso on the floor. Volador and Rey Misterio brought Misterioso back in the ring so he wouldn't lose that way. Volador covered Misterioso, but pulled him up at two. Misterioso would not wake up, so Volador put Misterioso on top for the three count and lost his mask, 3:12. Volador was Ramón Ibarra Banda of Monterrey. Misterioso refused to accept the mask and hugged his ex-tag team partner. 11:01, *** 3 1/2. Espectrito I fouled Octagoncito, Munequito fouled Espectrito I, Munequito faked a foul for the win. 8:44, ** 3/4. Fuerza and Super Munequito were in the corners. Fuerza interfered a lot, the mini ran after him, Fuerza posted the mini, Perro Sr. ran in, Perro Jr.w as distracted, and Juvi cradled Perro for the win. Guerrera fouled the Aguayos. **** 3/4, 11:40. Latin pinned Estrada. 1/2 *, way too long. Villanos won the first in 9:19, Payasos took the second in 4:47, Azul was pinned after two chairs shots in 11:20. *** 3/4, 19:47. Sagrada pinned Panther for the win. **. 8:34. Konnan escaped in 3:13. Other Dinamitas stopped Perro from leaving and came in the cage to stomp him. Konnan climbed in, and helped pass Perro to Octagon & Santo over the cage so he'd escape, and Konnan freed himself when Mascara accidentally hit Cien Caras. First hair loss for Cien, who was paid $23,000. Event Notes: Fans had to stand all show, because no chairs were there. The company responsible for supplying them had been told the show was canceled due to a wrestler unions strike. Conador faked a foul to win all three hair. The same rudos had previously won Brillante, Diamante and Zafiro's masks, and this was the end of them in this promotion. They bled a lot in this match. Lagarde was seconding the rudos and almost cost them the match a couple times, so the rudos turned on him and Perro Silva to set up the next feud.